RADIUM DIAL PAINTERS - What Happened to Them? A printout of this document (in pdf format) is available at: Dial Painters.pdf . Most everyone has heard about the tragedy that befell the young women who became dial painters. Their well-paying jobs, painting the hands and faces of clocks and watches with a radium paint, led many to an early and cruel death. The newspapers of that era, mid-to-late 1920s, described in excruciating detail the physical problems that befell "the women doomed to die". Many influential people took up the dial painters' cause in their attempts to obtain retribution through the courts for medical expenses and to punish the corporate blindness that led to their poisoning, but to no avail. What little financial support was obtained came too late for some, as legal maneuvering had delayed the trial outcomes until many of the painters were dead. A most readable description of these events has been written by Ross Mullner, in "Deadly Glow, The Radium Dial Worker Tragedy ", published by the American Public Health Association in 1999. In his book Mullner lists one hundred twelve dial painters known to have died as the result of ingesting the radium-containing paint as they shaped their brushes with their lips. The cause of their deaths was undoubtedly exposure to high levels of radiation over an extended period of time. At that time, however, little was known about radiation or about its effects, with the result that many different reasons for their illnesses were proposed. Ultimately, radium was identified as the culprit, and they were considered to have been poisoned by radium. Mullner then describes the intense study activated during and after World War II to find and study additional dial painters. The reason for this was that plutonium, to be used in atomic bombs, was known to deposit in bones and to emit alpha particles, just as radium did. What were the long term effects of radium in the body? How were these plutonium workers to be protected? Eventually all of the studies of the radium cases were centralized into one institution, the Center for Human Radiobiology at the Argonne National Laboratory. By the time this radium study was terminated in 1993, 3,161 radium dial painters had been identified and 1,575 of them had been seen and studied. (A total of 6,675 people containing radium had been identified and 2,403 of them had been located and measured. These numbers include persons who were exposed to radium in a variety of ways in addition dial painting.) Following the termination of this study, all the tabulated data was posted on the Internet, along with data obtained from other large studies of the effects of radiation on humans1. After the well published trials were over it was realized that most dial painters did not show any effects that could be attributed to "radium poisoning", and thus the dial painting industry continued, but at much reduced levels. With the passage of time some dial painters were diagnosed with malignancies arising in bone, identified as bone sarcomas. Much later a second kind of malignancy was recognized as being due to radium, carcinomas arising in the paranasal sinuses or the mastoid air cells. Since these malignancies are seldom seen in the general population they were quickly recognized as being induced by radium in the body. Surprisingly, no other malignancies or syndromes could be statistically associated with radium deposited within the human body. This did not mean that these later dial painters did not acquire radium within their bodies, for almost every dial painter that was measured in the subsequent search for those in this industry was found to have measurable radium within their bodies. However, the level within their bodies was significantly lower than the levels seen in the pre-1926 period. This is demonstrated in the diagram at the end of this document, where each of 1,468 dial painters is represented by a mark on the diagram defined by the date they started painting and the quantity of radium that had entered their body. The painters who ultimately developed one of the radium-induced malignancies are plotted as red symbols while those who never developed such malignancies are plotted in black. To understand the construction of this plot it is necessary to consider some facts about radium. Radium exists in several different forms, depending upon its parent All of the radium on earth was and is being continually created by the radioactive decay of some parent radioactive element. Ra-226, the most common form of radium, is created during the decay of the radioactive element uranium, specifically U-238, an element with a half-life of about 4.5 x 109 years. This radium was often used by the medical profession to treat many kinds of ailments, but it was very expensive. It was used in the dial painting industry as well, but it was often mixed with a less expensive form of radium, Ra-228. Ra-228 is created during the decay of thorium, Th-232, which has a half-life of about 1.4 x 1010 years. Radium is on the earth today only because its parents have such long half-lives that they have not had time to completely disappear since the earth was formed. These two radium elements are quite different. Ra-226, half-life 1620 years, emits an alpha particle, and is transformed into radon (half-life 3.8 days); eight more radioactive decays, which emit either alpha or beta particles, take place before it becomes an atom of non-radioactive lead. However, much of the radon, with its 3.8 day half-life, has time to reach the body fluids and be exhaled from the body through the lungs before it decays. Two-thirds of the radon Rn-222 produced in the body escapes in this fashion. The eight radioactive decays that follow this exhaled radon then take place outside of the body. In contrast, Ra-228, half-life 6.7 years, emits a beta particle when it decays. A total of nine radioactive decays, either alpha or beta, occur before a stable atom of lead is left to replace of the original radium atom. There is an atom of radon created in this chain of events, but since its half-life is only 55 seconds, very little escapes in the breath before it decays into a non-gaseous element. Thus Ra-228 delivers more energy to the surrounding tissues than does an equivalent quantity of Ra-226. The complete measurement of radium in the body of a dial painter yields two values, one for Ra-226 and one for Ra-228. Since the ratio of Ra-228 to Ra-226 might vary with each batch of paint being used, it was not possible to compare radium cases on the basis of the quantity of radium within the body. What was needed was a method of defining a "radium equivalent", so all measured cases could be expressed in the same units. It has been determined that, per microcurie (�Ci) of intake, Ra-228 is 2.5 times as effective as Ra-226 in inducing bone sarcomas. Thus a unit, Initial Systemic Intake2, may be used to define the risk of the induction of a bone sarcoma in a given dial painter. It is the sum of the activity of Ra-226, in �Ci, that entered the body plus two and a half times the activity of Ra-228, in �Ci, that entered the body. 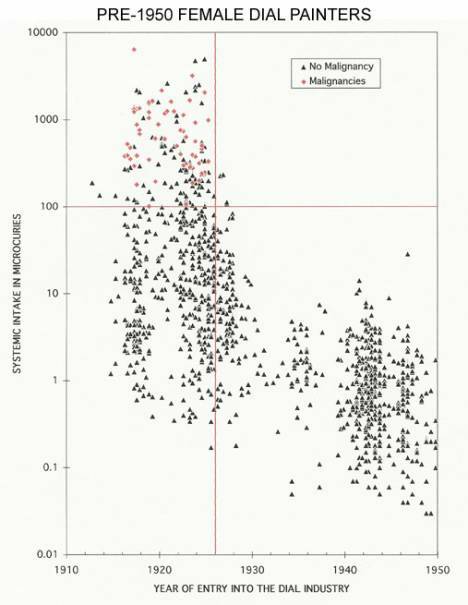 Note the two red lines drawn on this plot; the vertical line is drawn at the year 1926, the horizontal one at an Initial Systemic Intake value of 100 �Ci. There are no malignancies (red diamonds) in or after 1926, indicating that no dial painter who started after this date ever experienced one of the known radium-induced malignancies. There are no red diamonds below the horizontal line drawn at 100 �Ci, indicating that an intake of greater than 100 �Ci is required to induce the radium-induced malignancies. It is also clear that the simple rule "Do not tip the brush with your lips" was all that was necessary to reduce markedly the amount of radium acquired by these dial painters. Note that this plot only shows dial painters who entered the industry before 1950. There were very few dial painters who started after this date, and their working conditions were so strictly monitored that none had high intakes. None of these malignancies has ever been diagnosed in post-1950 painters. Stehney's second study, extended to include all dial painters who started work before 1950, confirmed the first study. There was very little evidence that this population of radium-burdened individuals suffered any life-shortening disorders other then radium-induced malignancies. Further, as indicated by the plot printed above, there appears to be a threshold intake level below which no radium-induced malignancies have been diagnosed. These are remarkable conclusions, and clearly conflict with the conventional wisdom that insists that all radiation is harmful. They come as no surprise to those of the scientific community who have been familiar with the studies of radioisotopes deposited within the human body, but such information has not been widely disseminated among the public. A monograph has been published describing the findings of the radium studies program at the Argonne National Laboratory 5, but is now out of print. It included a section containing some of the data collected on persons whose body contents of radium have been measured. This is now available on the Internet6. Likewise, as mentioned previously, all of the data collected on the radium dial painters and others exposed to radium has been posted on the Internet1. 2. Rowland, R. E., Stehney, A. F., and Lucas, H. F., Jr.: Dose-response relationships for female radium dial workers, Rad. Research, 76: 368-383 (1978). 3. Stehney, A. F., H. F. Lucas, R. E. Rowland. Survival times of women radium dial workers first exposed before 1930. In: Late Biological Effects of Ionizing Radiation. proceedings of I.A.E.A. Symp., Vienna 1: 333-351. (1978). 4. Stehney, A. F. Survival times of pre-1950 U.S. women radium dial workers. Proceedings of the International Seminar "Health effects of internally deposited radionuclides: emphasis on radium and thorium", Heidelberg, Germany, pp. 149-155. (1994). 5 Rowland, R. E. Radium in Humans: A Review of U. S. Studies. Argonne National Laboratory, Argonne Ill. (1994).